Mutations in genes encoding HNF-4α, HNF-1α and IPF-1/Pdx-1 are associated with, respectively, MODY subtypes-1, -3 and -4. Impaired glucose-stimulated insulin secretion is the common primary defect of these monogenic forms of diabetes. A regulatory circuit between these three transcription factors has also been suggested. We aimed to explore how Pdx-1 regulates beta cell function and gene expression patterns. We studied two previously established INS-1 stable cell lines permitting inducible expression of, respectively, Pdx-1 and its dominant-negative mutant. We used HPLC for insulin processing, adenovirally encoded aequorin for cytosolic [Ca2+], and transient transfection of human growth hormone or patch-clamp capacitance recordings to monitor exocytosis. Induction of DN-Pdx-1 resulted in defective glucose-stimulated and K+-depolarisation-induced insulin secretion in INS-1 cells, while overexpression of Pdx-1 had no effect. We found that DN-Pdx-1 caused down-regulation of fibroblast growth factor receptor 1 (FGFR1), and consequently prohormone convertases (PC-1/3 and -2). As a result, DN-Pdx-1 severely impaired proinsulin processing. In addition, induction of Pdx-1 suppressed the expression of glucagon-like peptide 1 receptor (GLP-1R), which resulted in marked reduction of both basal and GLP-1 agonist exendin-4-stimulated cellular cAMP levels. Induction of DN-Pdx-1 did not affect glucokinase activity, glycolysis, mitochondrial metabolism or ATP generation. The K+-induced cytosolic [Ca2+] rise and Ca2+-evoked exocytosis (membrane capacitance) were not abrogated. The severely impaired proinsulin processing combined with decreased GLP-1R expression and cellular cAMP content, rather than metabolic defects or altered exocytosis, may contribute to the beta cell dysfunction induced by Pdx-1 deficiency. Supplementary material is available for this article at http://dx.doi.org/10.1007/s00125-005-1692-8. MODY is a monogenic form of type 2 diabetes characterised by early age of onset and autosomal dominant transmission. It is not usually associated with insulin resistance. With the exception of MODY-2 (glucokinase), MODY (-1, -3, -4, -5 and -6) has been linked to mutations in genes coding for the transcription factors, respectively, HNF-4α, HNF-1α, IPF-1/PDX-1/IDX-1, HNF-1β and NeuroD/BETA-2. Although mutations in these transcription factors display heterogeneous clinical phenotypes, the primary cause of the various MODY subtypes has been attributed to beta cell dysfunction. Only one MODY-4 family has been described in which a homozygous mutation carrier had pancreatic agenesis while heterozygous subjects developed early-onset diabetes [1, 2]. The mutation in this family (IPF-1-P63fsdelC) directs expression of a dominant-negative protein . 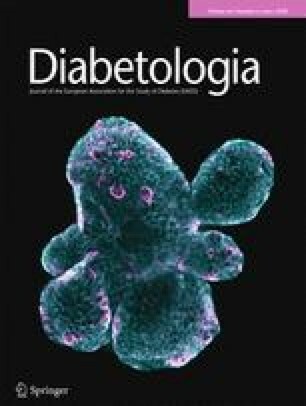 Diabetic MODY-4 family members heterozygous for the mutation exhibit severe impairment of insulin secretion and enhanced insulin sensitivity, indicating that the primary defect is beta cell dysfunction . Missense mutations in the IPF-1 gene have also been demonstrated to predispose to late-onset type 2 diabetes [5, 6]. In the mouse, Pdx-1 has been reported to regulate early pancreatic development and to control the expression of insulin as well as other beta-cell-specific genes [7, 8, 9, 10]. Targeted disruption of the PDX-1 gene results in pancreatic aplasia, while heterozygous mice exhibit impaired glucose tolerance [8, 9, 11, 12]. Beta-cell-specific inactivation of the PDX-1 gene causes diabetes with increasing age, whereas mice with one deleted PDX-1 allele only develop glucose intolerance . Inducible suppression of Pdx-1 function in mouse beta cells using an antisense ribozyme specific for Pdx-1 mRNA under control of the reverse tetracycline transactivator also evokes age-dependent diabetes . Pdx-1 plays an essential role in the regulation of beta cell neogenesis, differentiation and perhaps apoptosis [15, 16, 17, 18]. Accordingly, transgenic overexpression of PDX-1 restores beta cell mass and function, thereby preventing the onset of diabetes in IRS2-null mice . Adenovirus-mediated Pdx-1 overexpression in the pancreas of the mouse favours beta cell neogenesis, whereas ectopic expression of Pdx-1 in mouse liver or human fetal liver progenitor cells promotes differentiation into insulin-producing cells [18, 19, 20]. Glucose intolerance due to defective glucose-stimulated insulin secretion has been reported in the heterozygous PDX-1-mutant mouse . Both reduced Glut-2 expression and decreased glucose-evoked NAD(P)H generation in islets are also observed, suggesting impaired glucose metabolism . However, the Pdx-1 target genes responsible for this secretory defect are yet to be identified. Using INS-1 stable cell lines capable of expressing HNF-1α and HNF-4α or their dominant-negative mutants DN-HNF-1α and DN-HNF-4α in a doxycycline-dependent manner, we identified several target genes of HNF-1α and HNF-4α and suggested that the metabolism–secretion coupling in beta cells is affected in MODY-1 and MODY-3 [21, 22, 23]. It has been proposed that HNF-1α mediates transcription of the PDX-1 gene [24, 25]. Furthermore, a MODY-1 family was reported in which the Pdx-1 binding site in the HNF-4α P2 promoter is mutated, suggesting a regulatory circuit between Pdx-1, HNF-4α and HNF-1α . In a previous study on INS-1 cell lines permitting inducible overexpression or suppression of Pdx-1 we reported that this transcription factor is necessary for the beta-cell-like phenotype by inhibiting expression of glucagon, the hormone secreted by the alpha cells . To substantiate phenotype determination and to elucidate the mechanisms underlying the impaired insulin secretion caused by Pdx-1 deficiency, we examined insulin secretion, glucose metabolism, intracellular ATP and cAMP levels, beta cell gene expression profiles, cytosolic [Ca2+] and membrane capacitance in our established cellular models, which allow inducible expression of Pdx-1 or its dominant-negative mutant DN-Pdx-1 . INS-1 stable cell lines, Pdx-1#6 and DN-Pdx-1#28, allowing inducible expression of, respectively, wild-type Pdx-1 and DN-Pdx-1 (lacking the N-terminal 79 amino acids), were cultured as previously described . Cells were cultured with or without 500 ng/ml doxycycline for 24 h. Nuclear proteins were extracted as previously described . For total cellular protein extraction, cells were sonicated in lysis buffer containing (mmol/l): 20 Tris–HCl, pH 7.4, 2 EDTA, 2 EGTA, 1 PMSF and 1% Triton X-100. Nuclear extracts and total cellular proteins were fractionated by 7–11% SDS-PAGE. Immunoblotting was performed as described previously using enhanced chemiluminescence (Pierce, Rockford, IL, USA) for detection . The dilutions for antibodies against Pdx-1 (a kind gift from Dr. H. Edlund), glucokinase (Santa Cruz, Basel, Switzerland), syntaxin A (Sigma, Buchs, Switzerland) and PC1/3 (a generous gift from Dr D. F. Steiner) were 1:6,000, 1:2,000, 1:2,000, 1:1,000, 1:5,000 and 1:2,000, respectively. For immunofluorescence, cells grown on polyornithine-coated glass coverslips were treated for 24 h with or without 500 ng/ml doxycycline. Cells were then washed, fixed in 4% paraformaldehyde, and permeabilised with 0.1% Triton X-100 in phosphate-buffered saline containing 1% BSA (PBS–BSA). The preparation was then blocked with PBS–BSA before incubating with the first antibody, anti-Pdx1 (1:1,000 dilution), followed by the second antibody labelling. Nuclear extracts from Pdx-1#6 and DN-Pdx-1#28 cells grown in culture medium with or without 500 ng/ml doxycycline for 24 h were prepared according to Schreiber et al. . The double-stranded oligonucleotides corresponding to the rat insulin I FLAT element , 5′gatcttgttaataatctaattacc3′, was used as a probe. Electrophoretic mobility-shift assay (EMSA) procedures including conditions for probe labelling and binding reactions were performed as in Wang et al. . Cells in 12-well plates were cultured in 11.2 mmol/l glucose medium with or without 500 ng/ml doxycycline for 4 days, followed by an additional 5 h equilibration in 2.5 mmol/l glucose medium. Insulin secretion was measured over a period of 30 min in Krebs–Ringer–Bicarbonate–HEPES buffer (KRBH) (mmol/l: 140 NaCl, 3.6 KCl, 0.5 NaH2PO4, 0.5 MgSO4, 1.5 CaCl2, 2 NaHCO3, 10 HEPES and 0.1% BSA) containing indicated stimuli. Insulin content was determined after extraction with acid ethanol following the procedures of Wang et al. . Insulin was determined by radioimmunoassay using rat insulin as a standard  and a commercial antibody, not distinguishing between proinsulin and insulin (Linco, St. Charles, MO, USA). Cytosolic proteins were extracted, according to Wang and Iynedian , from cells cultured in 11.2 mmol/l glucose medium in the presence or absence of 500 ng/ml doxycycline for 4 days. Total hexokinase activity was measured at 30°C by a glucose-6-phosphate dehydrogenase-coupled assay in a spectrophotometer (Lambda Bio20, Perkin Elmer, Switzerland), monitoring NADH production . Glucokinase activity was calculated as the differences in NADH produced at 100 and 0.5 mmol/l glucose and expressed in nmol/min (=mU) per mg of protein. Cells in 24-well dishes were cultured in standard medium (11.2 mmol/l glucose) with or without 500 ng/ml doxycycline for 72 h. The culture was continued in 2.5 mmol/l glucose medium with or without 500 ng/ml doxycycline for a further 24 h. The rate of glycolysis was estimated from the production of [3H] water from d-[5-3H]glucose according to Wang and Iynedjian . DN-Pdx-1#28 cells in 24-well plates were cultured in standard medium (11.2 mmol/l glucose) with or without 500 ng/ml doxycycline for 4 days. The production of 14CO2 from [2-14C] pyruvate was measured over 1 h in KRBH containing either 0.05 or 1.0 mmol/l pyruvate as reported previously . Cells in six-well dishes were cultured with (+Dox) or without (−Dox) 500 ng/ml doxycycline in standard medium (11.2 mmol/l glucose) for 3 days and then equilibrated in 2.5 mmol/l glucose medium for a further 24 h. Cellular ATP was measured after 8 min of stimulation with 20 mmol/l glucose as previously described . Cellular cAMP was measured after 30 min of stimulation with or without 10 nmol/l Exendin-4 in KRBH containing 2.5 or 20 mmol/l glucose according to the manufacturer’s protocol (cAMP Biotrak enzyme-immunoassay system; Amersham Biosciences, Freiburg, Germany). Pdx-1#6 cells in 10-cm diameter dishes were cultured in standard medium (11.2 mmol/l glucose) with or without the indicated concentration of doxycycline for 96 h, unless otherwise specified. DN-Pdx-1#28 cells in 10-cm diameter dishes were cultured in standard medium (11.2 mmol/l glucose) with or without 500 ng/ml doxycycline for 72 h. The culture was continued in 2.5 mmol/l glucose medium with or without 500 ng/ml doxycycline for 16 h, followed by an additional 8 h in culture medium with 2.5, 6, 12 or 24 mmol/l glucose. Total RNA was extracted and blotted on nylon membranes as described previously . The membrane was prehybridised and then hybridised to 32P-labelled random primer cDNA probes according to Wang and Iynedijian . To ensure equal RNA loading and even transfer, all membranes were stripped and rehybridised with a ‘housekeeping gene’ probe cyclophilin. cDNA fragments used as probes for glucokinase, Glut-2, l-pyruvate kinase, Rab3A, VAMP-2, SNAP25A, Synaptotagmin-1 and Pdx-1 mRNA detection were digested from corresponding plasmids. cDNA probes for rat aldolase B, glyceraldehyde-3 phosphate dehydrogenase (GAPDH), adenine nucleotide translocator-1 and 2 (ANT-1, ANT-2), mitochondrial uncoupling protein-2 (UCP-2), clathrin heavy chain, clathrin light chain, cyclin-dependent kinase-4 (CDK4), insulin receptor substrate-2 (IRS2), connexin-36, E-cadherin, N-cadherin, neural cell adhesion molecule (N-CAM), suppressor of cytokine signalling-3 (SOCS-3), signal transducer and activator of transcription (STAT)-1, -3, -5, Cav1.3 (α1D), prohormone convertases (PC-1/3 and -2), adiponectin receptor (AdipoR), short-chain 3-hydroxyacyl-CoA dehydrogenase (SCHAD), fibroblast growth factor receptor 1 (FGFR1), and glucagon-like peptide-1 receptor (GLP-1R) were prepared by RT-PCR and confirmed by sequencing. Recombinant adenovirus encoding cytosolic aequorin under the chicken actin promoter (rAdCAGcAQ) was used . DN-Pdx-1#28 cells were grown on polyornithine-coated plastic coverslips for 3 days in the absence or presence of doxycycline (500 ng/ml) and infected with rAdCAGcAQ for 90 min at approximately 50 PFU/ml. The [Ca2+]c was measured 20 h later as previously described . Briefly, cells were pre-incubated with 2.5 μmol/l coelenterezine (Calbiochem, San Diego, CA, USA) for 2–3 h and then perfused with KRBH containing 2.5 mmol/l glucose and 30 mmol/l KCl as stimulator. Emitted photons were collected with a photomultiplier apparatus (Thorn-Emi Electron tubes, UK). Cells were seeded on glass coverslips and cultured without (−Dox) or with (+Dox) 500 ng/ml doxycycline for 4 days. The extracellular solution contained (mmol/l): 140 NaCl, 3.6 KCl, 2 NaHCO3, 2.6 CaCl2, 0.5 NaH2PO4, 0.5 MgSO4, 5 HEPES and 2.5 glucose. The pH was set to 7.40 using NaOH. For membrane capacitance recordings, the pipette solutions contained (mmol/l): 125 potassium glutamate, 10 KCl, 10 NaCl, 1 MgCl2, 5 HEPES, 3 Mg-ATP, 10 EGTA and 0 or 9.57 CaCl2. Using the Ca2+ chelator program WEBMAXC (http://www.stanford.edu/~cpatton/webmaxc/webmaxcS.htm) the free Ca2+ concentrations were estimated to be lower than 0.1 nmol/l and 5 μmol/l, respectively. The pH was set to 7.15 using KOH. For patch clamp capacitance recordings a glass coverslip was transferred to a temperature-controlled perfusion chamber. The chamber was perfused, using a gravity-driven perfusion system, with extracellular solution at a rate of 1.3 ml/min. Bath temperature was maintained at 32–33°C. Patch pipettes were pulled from borosilicate glass capillaries (GC150F-10; Clark Instruments, Reading, UK) on a Model P-97 puller from Sutter Instruments (Novato, CA, USA). Pipette resistance was between 4 and 6 MΩ. Patch-clamp recordings were performed with a List EPC 9 amplifier (HEKA, Darmstadt, Germany) in voltage-clamp mode. Capacitance was measured after applying a 1-kHz, 28-mV peak-to-peak sinusoid stimulus from a dc holding potential of −70 mV. The ‘sine + dc’ mode of the software lock-in extension of the PULSE software was used to calculate the equivalent circuit parameters C m (membrane capacitance), membrane conductance (G m) and access resistance (R a) from the current recordings. DN-Pdx-1#28 cells in 24-well plates were transiently transfected with 2 μg/plate of pcDNA3-hGH encoding human growth hormone using Effectene (Qiagen, Basel, Switzerland) according to manufacturer’s protocol . After 16 h of transfection, cells were cultured with or without 500 ng/ml doxycycline for 4 days in standard medium (11.2 mmol/l glucose) and continued for a further 5 h in 2.5 mmol/l glucose medium. Human growth hormone secretion stimulated by 24 mmol/l glucose, 100 μmol/l tolbutamide and 20 mmol/l KCl was measured over a period of 30 min in KRBH containing 2.5 mmol/l glucose (basal). Human growth hormone was quantified by ELISA (Roche, Rotkreuz, Switzerland). DN-Pdx-1#28 cells in 3.5-cm diameter dishes were cultured in standard medium (11.2 mmol/l glucose) with or without 500 ng/ml doxycycline for 4 days. The cells were then washed and radiolabelled (2–4 mBq [3H]leucine) for 10 min at 37°C in KRBH, 16.7 mmol/l glucose. After washing in KRBH, 1.7 mmol/l glucose with 1 mmol/l unlabelled leucine, the pulse-labelled cells were incubated at 37°C for 60 or 120 min (chase) in this same buffer. At the end of the chase incubation, cells were extracted and analysed by reversed-phase HPLC as described in detail previously . Results are expressed as means±SEM and statistical analyses were performed by Student’s t-test for unpaired data. We previously established Pdx-1#6 and DN-Pdx-1#28 cells using the parental INS-rβ (r9) cells . Western blotting with an antibody against the C terminus of Pdx-1 demonstrated that both Pdx-1 and DN-Pdx-1 proteins were induced, respectively, in Pdx-1#6 and DN-Pdx-1#28 cells treated with 500 ng/ml doxycycline for 24 h (Fig. 1a). EMSA with the rat insulin I promoter element showed that Pdx-1 protein binding was increased by 10-fold and diminished by 90%, respectively, in Pdx-1#6 and DN-Pdx-1#28 cells under the same conditions (Fig. 1b). The Pdx-1 and DN-Pdx-1 binding complexes were supershifted by anti-Pdx-1 antibody (data not shown). It is noteworthy that DN-Pdx-1 protein was undetectable under non-induced conditions (Fig. 1a and b). Immunofluorescence staining of DN-Pdx-1#28 cells with the same antibody illustrated that all cells uniformly expressed the nuclear localised DN-Pdx-1 protein (Fig. 1c). Similar results were obtained in Pdx-1#6 cells (data not shown). As demonstrated in Fig. 2a, overexpression of Pdx-1 in INS-1 cells did not alter glucose-stimulated insulin secretion. In contrast, similar induction of DN-Pdx-1 blunted glucose-, leucine-, and K+-evoked insulin release (Fig. 2b). After 4 days of treatment with 500 ng/ml doxycycline, insulin content was increased by 37% (−Dox: 1.497±0.199; +Dox: 2.033±0.281 μg/mg protein) in Pdx-1#6 cells and decreased by 57% (−Dox: 1.957±0.303; +Dox: 0.857±0.22 μg/mg protein) in DN-Pdx-1#28 cells. Therefore, insulin secretion in these cells was expressed as percentage of cellular insulin content. Since Pdx-1 has been proposed to regulate PC-1/3 expression through FGFR1 signalling , we examined the mRNA levels of FGFR1 and PC-1/3 in Pdx-1#6 and DN-Pdx-1#28 cells cultured with or without 500 ng/ml doxycycline for 4 days. As demonstrated by quantitative Northern blotting in Fig. 3, induction of DN-Pdx-1 for 4 days suppressed the mRNA levels of FGFR1 by 50%. Graded overexpression of Pdx-1 for 4 days resulted in a modest increase in the mRNA levels of PC1/3 and PC2 (Fig. 3a). In contrast, 4 days of induction of DN-Pdx1 suppressed the expression of PC1/3 and PC2 by 90 and 40%, respectively (Fig. 3b). The protein levels of PC-1/3 were also reduced by 80%, whereas the expression of glucokinase protein was unaltered (Fig. 3c). Both PC1/3 and PC2, which are expressed in pancreatic beta cells and INS-1 cells, are implicated in the processing of proinsulin to insulin [37, 38, 39]. PC1/3 cleaves preferentially at the B-chain/C-peptide junction and thereby facilitates the second maturation cleavage by PC2 at the C-peptide/A-chain junction [35, 37, 38, 39, 40]. To examine the consequences of reduced expression of PC1/3 on proinsulin processing, we analysed the pattern of radiolabelled proinsulin-related products during a pulse-chase protocol . As depicted in Fig. 4a, dominant-negative suppression of Pdx-1 led to severely defective proinsulin processing. Thus at 120 min, proinsulin conversion was inhibited by more than 60%. To investigate hormone independently of regulation of insulin gene expression and processing, we transfected DN-Pdx-1#28 cells with a cDNA encoding human growth hormone. This polypeptide hormone is stored and co-secreted with insulin but is not processed by prohormone-convertase 1/3 (PC1/3) [34, 39, 41]. As illustrated in Fig. 4b, induction of DN-Pdx-1 caused significant decrease in human growth hormone secretion stimulated by glucose, tolbutamide and K+. Tolbutamide blocks ATP-dependent K+-( KATP) channels, whereas K+ directly depolarises the plasma membrane potential. DN-Pdx-1*28 cells were cultured with or without 500 ng/ml doxycycline for 3 days in standard glucose medium. The culture was continued for a further 24 h in 2.5 mmol/l glucose medium. Overexpression of Pdx-1 had minor effects on GLP-1R expression, whereas induction of DN-Pdx-1 for 4 days suppressed the mRNA levels of GLP-1R by 90% (Fig. 5). We therefore measured the intracellular cAMP levels and GLP-1 agonist-stimulated insulin secretion under the same conditions. DN-Pdx-1 reduced the intracellular cAMP content by 40% at basal (2.5 mmol/l) glucose conditions (Fig. 6a). In non-induced cells, the GLP-1R agonist exendin-4 raised the cAMP concentrations by 2-fold at both 2.5 and 20 mmol/l glucose (Fig. 6a). In contrast, the exendin-4-induced cAMP increase was completely inhibited in INS-1 cells expressing DN-Pdx-1 (Fig. 6a). Consequently, exendin-4-induced insulin secretion was also blocked by induction of DN-Pdx-1 (Fig. 6b). Forskolin stimulates adenylate cyclase and IBMX inhibits phosphodiesterases, leading to robust increases in cellular cAMP levels (Fig. 6c). The insulin secretion induced by these agents was unaffected by DN-Pdx-1 (Fig. 6d). The marked increase in cellular cAMP levels induced by forskolin plus IBMX were, however, slightly reduced by DN-Pdx-1 (Fig. 6c) (p<0.05). To examine the possibility that suppression of Pdx-1 function impairs metabolism-secretion coupling , we measured glucose metabolism in DN-Pdx-1#28 cells. Pdx-1 was previously reported to regulate glucokinase gene expression . However, we found that glucokinase activity was unaltered in Pdx-1#6 (−Dox: 10.06±2.07; +Dox: 11.70±1.48 mU mg protein−1 h−1; n=7) and DN-Pdx-1#28 (−Dox: 10.80±1.33; +Dox: 12.41±1.33 mU mg protein−1 h−1; n=7) cells after treatment with 500 ng/ml doxycycline for 4 days. Under the same conditions, neither glucose utilisation (Fig. 7) nor mitochondrial oxidation (Fig. 7b) was altered in DN-Pdx-1#28 cells. In good agreement, cellular ATP content was unchanged by induction of DN-Pdx-1 (Fig. 7c). These results suggest that the target genes of Pdx-1 are distinct from those of HNF-1α and HNF-4α, the latter controlling mitochondrial function [21, 22, 23]. To substantiate this, we analysed the gene expression patterns in Pdx-1#6 and DN-Pdx-1#28 cells under non-induced and induced conditions. As shown in Fig. 8a, up-regulation of Pdx1 for 4 days did not alter the mRNA levels of glucokinase, l-pyruvate kinase (l-PK), aldolase B, glyceraldehyde-3-phosphate dehydrogenase (GAPDH), uncoupling protein 2 (UCP2), or adenine nucleotide translocator 1 and 2 (ANT1 and ANT2). Similarly, dominant-negative suppression of Pdx-1 for 4 days had no effects on these transcripts (Fig. 8b). However, there was a 90% decrease in Glut2 expression. As the capacity of this sugar transporter is in large excess of the activity of glucokinase and other glycolytic enzymes, even this decrease would not have been expected to affect glucose metabolism. Therefore in the present cellular model, Pdx-1 does not control glycolysis and mitochondrial metabolism. Consequently, we investigated further the effects of Pdx-1 on the expression of genes implicated in insulin processing and secretion, as well as granule maturation and exocytosis. As shown in Fig. 9a and b, K+ elicited a pronounced increase in cytosolic [Ca2+]. This response was not attenuated but actually increased by 15% following induction of DN-Pdx-1. This suggests that DN-Pdx-1-induced impairment of insulin secretion is not caused by reduced cytosolic [Ca2+]. In order to investigate whether Pdx-1 controls genes implicated in the exocytotic machinery we measured membrane capacitance to study the exocytotic response to infusion of Ca2+ (5 μmol/l) through the patch pipette. Measurement of capacitance began a few seconds after establishment of the whole cell configuration. Typical traces are shown in Fig. 9c. It is seen that capacitance increases in a continuous manner following patch rupture. No change in capacitance was obtained in the absence of Ca2+ in the pipette solution (not shown). In order to compare the exocytotic response to the Ca2+ infused through the patch pipette we measured the average increase in capacitance between 60 and 120 s after patch rupture. As shown in Fig. 9d, there was no difference between cells cultured in the presence or absence of doxycycline. Likewise, the initial capacitance (6.33±0.32 and 6.39±0.32, respectively) was unaffected by doxycycline treatment. In conclusion, Ca2+-induced exocytosis does not seem to be affected by dominant-negative suppression of Pdx-1. To further investigate whether Pdx-1 controls genes participating in exocytosis, we examined the transcript levels of clathrin heavy and light chains, VAMP-2, Rab3A, SNAP25A, synaptotagmin-1, voltage-dependent Ca2+ channel Cav1.3 (α1D) subunit [see Electronic Supplementary Material (ESM), address on first page of article]. Clathrin seems to play an important role in the removal of proteases from maturing granules . VAMP-2, Rab3A, SNAP25A and synaptotagmin I are implicated in insulin exocytosis [44, 45, 46]. Voltage-dependent Ca2+ channel Cav1.3 (α1D) subunit is involved in mediating beta cell insulin secretion in response to rising concentrations of glucose . All these proteins are required for normal glucose-stimulated insulin secretion. Pdx-1 did not regulate mRNA levels of these genes (see ESM). We characterised further the effects of Pdx-1 on expression of other genes potentially involved in beta cell function (see ESM), including cyclin-dependent kinase-4 (CDK4), insulin receptor substrate-2 (IRS2) [13, 36, 48, 49, 50, 51], connexin-36, E-cadherin, N-cadherin, neural cell adhesion molecule (N-CAM), suppressor of cytokine signalling-3 (SOCS-3), signal transducer and activator of transcription (STAT)-1, -3, -5 [52, 53, 54, 55], adiponectin receptor (AdipoR)  and short-chain 3-hydroxyacyl-CoA dehydrogenase (SCHAD) . Neither overexpression nor dominant-negative suppression of Pdx-1 altered the mRNA levels of these genes, except that induction of DNPdx-1 inhibited STAT-5 but increased STAT-1 expression (see ESM). Reduced expression of FGFR1 has been reported in islets of mice with beta-cell-specific deletion of PDX-1 . Concordantly, we found that dominant-negative suppression of Pdx-1 decreased mRNA levels of FGFR1 in INS-1 cells. Our data also support previous findings that Pdx-1 acts upstream of FGFR1 signalling in beta cells to maintain insulin processing . The mice with attenuated FGFR1c signalling develop diabetes with age and exhibit decreased beta cell mass, reduced Glut-2 levels and increased proinsulin content in beta cells owing to defective expression of PC1/3 and 2 . The present study demonstrated that induction of DNPdx-1 caused 80–90% reduction in PC1/3 expression at both mRNA and protein levels. In addition, PC1/3 deficiency correlated well with the severe impairment of proinsulin conversion. PC1/3 is the predominant hormone convertase in beta cells [37, 39, 58]. In agreement with previous studies in PDX-1 (+/−) mice [12, 15], dominant-negative suppression of Pdx-1 also caused defective insulin secretion stimulated by glucose, leucine and K+. This was not due to the decreased insulin content, since the data were expressed as percentage of cellular insulin. The reduced insulin content is an expected consequence of the lower insulin mRNA levels after suppression of Pdx-1 function . The inhibition of insulin mRNA levels was not seen in rat islets after adenovirus-mediated expression of DN-Pdx-1 . Expression of DN-Pdx-1 in rat islets also caused impaired mitochondrial metabolism through suppression of the nuclear factor TFAM leading to decreased expression of mitochondrially encoded genes, including subunits of the respiratory chain complexes . In the primary cells, the reduced ATP generation from glucose explains the inhibition of insulin secretion . Induction of DN-Pdx-1 in INS-1 cells did not affect glucose metabolism and ATP generation but rather inhibited insulin secretion probably by affecting steps distal to the generation of mitochondrial coupling factors. It may be speculated that the apparent discrepancy between islets and INS-1 cells lies in different control of mitochondrial transcriptional activity in mature beta cells and proliferating insulinoma cells with higher energy requirement. Although it has been previously reported that Pdx-1 regulates beta cell glucokinase gene expression , the present data and other in vivo studies do not support this notion [13, 60]. In contrast, these studies suggest that Pdx-1 may act in coordination with some other factors rather than functioning independently on the glucokinase promoter. Therefore, manipulation of Pdx-1 function alone is not sufficient to regulate the beta glucokinase expression. The defective secretory response cannot be explained by an increase in impaired cytosolic [Ca2+], as the K+-evoked response was not inhibited. Moreover, the process of exocytosis was unaffected as monitored by Ca2+-induced changes in membrane capacitance or as judged from the expression profile of the principal genes implicated in the final steps of insulin secretion. Similarly, the attenuated insulin secretion is not due to inhibition of proinsulin processing, as co-secreted human growth hormone (transiently transfected), which is not processed by PC-1/3, was equally unaffected. The most likely explanation for the impaired insulin secretion in response to nutrients and K+ depolarisation is the pronounced decrease in cAMP levels after suppression of Pdx-1 function. This is a consequence of reduced GLP-1R expression. It has been demonstrated that the GLP-1R is capable of regulating basal cellular cAMP levels even in the absence of the ligand . We found that both basal and GLP-1R agonist exendin-4-induced cellular cAMP levels were markedly reduced by dominant-negative suppression of Pdx-1. DN-Pdx-1 also inhibited exendin-4- but not forskolin+IBMX-stimulated insulin secretion, the latter combination resulting in a more marked rise in cellular cAMP levels. Increasing cAMP levels with forskolin and IBMX also completely restored glucose-stimulated insulin secretion in rat islets infected with adenoviral DN-Pdx-1 . The preserved exocytotic response of DNPdx-1 cells to Ca2+ infusion through the patch-clamp pipette indicates that dialysis of the cells has eliminated the inhibition observed when K+ depolarisation was used to raise cytosolic [Ca2+]. We therefore propose that Pdx-1 may affect insulin secretion by changing cellular cAMP levels through GLP-1R pathways. The preserved secretory response to forskolin/IBMX may be explained by direct activation of exocytosis through the low-affinity, protein kinase A-independent cAMP-GEF II mechanism operative in the beta cell . In addition, as GLP-1 has been shown to regulate Pdx-1 activation [63, 64, 65], there may exist a functional regulatory loop between GLP-1 and Pdx-1. Furthermore, an elegant study on mice lacking GLP-1 and GIP receptors has demonstrated that gluco-incretin hormones regulate insulin secretion by three different mechanisms . First, they have additive insulinotropic effects on cells during oral glucose tolerance tests. Second, in the absence of the GLP-1 receptor, there is suppression of the first phase of insulin secretion measured in vivo, but not in the isolated islets, indicating a role for this receptor in the function of glucose sensors that are located outside the endocrine pancreas and that control first-phase secretion. Third, absence of both receptors causes a cell-autonomous insulin secretion defect at a site distal to plasma membrane depolarisation . GLP-1R plays an important role in the regulation of beta cell neogenesis, development, differentiation and survival as well as insulin secretion [50, 51, 67, 68, 69]. GLP-1-stimulated insulin secretion was not reduced in Pdx-1+/− mice , but there was an attenuation in mice with beta-cell-specific deletion of Pdx-1 . The results obtained in the latter mouse model resemble those of our INS-1 expressing DN-Pdx-1, which could be explained by the shift from a beta cell to an alpha cell phenotype seen in mice with beta-cell-specific deletion of Pdx-1 and our INS-1 cells expressing DN-Pdx-1 [13, 27] (as discussed below). This phenotype shift is not obvious in Pdx-1+/− mice . Since it is not known which mouse model most closely resembles the phenotype of MODY-4, data from different studies should be taken into account. We have previously demonstrated that dominant-negative suppression of Pdx-1 in INS-1 cells led to reduced beta-cell-specific gene expression and increased glucagon levels . Concordantly, beta-cell-specific deletion of Pdx-1 also results in decreased beta cell mass and elevated alpha cell population . The loss of beta-cell-like phenotypes may contribute to the impaired insulin secretion and defective expression of GLP-1R and PC1/3 in our INS-1 cells expressing DN-Pdx-1. Likewise, the glucose transporter Glut-2, which is absent from alpha cells, was repressed in INS-1 cells expressing DN-Pdx-1, coinciding with a marked increase in glucagon transcript levels . Both GLP-1R and PC1/3 are highly expressed in beta cells and are, respectively, not detected or barely detected in alpha cells [39, 58, 71]. Although the shift from a beta cell to an alpha cell phenotype has also been demonstrated in mice with beta-cell-specific deletion of Pdx-1 , the pathogenesis implicated in beta cell dysfunction in MODY-4 patients remains to be defined. In conclusion, the severely impaired proinsulin processing combined with decreased expression of GLP-1R and reduced intracellular cAMP levels, rather than metabolic defects or altered exocytosis, may contribute to the beta cell dysfunction induced by Pdx-1 deficiency. Suppression of Pdx-1 favours loss of beta cell phenotype and beta-cell-specific gene expression. The molecular mechanisms underlying beta cell pathology of MODY-4 are thus distinct from those of MODY-1 and MODY-3. We are grateful to S. Dupuis, D. Cornut-Harry, D. Nappey, Y. Dupré, S. Mouche and V. Calvo for expert technical assistance. We are indebted to H. Edlund (Pdx-1 cDNA and antibody), D. F. Steiner (PC1/3 antibody), H. Bujard (PUHD 10-3 vector) and N. Quintrell (pTKhygro plasmid). This work was supported by the Swiss National Science Foundation (grant no. 32-66907.01 to C. B. Wollheim and 3200-06177.00 to P. A. Halban) and the European Network Grant (GrowBeta) through the Swiss Office for Education and Science (grant no. 01.0260 to C. B. Wollheim), and a generous donation from Hubertus Spierings (Geneva, Switzerland) through the Foundation of Medical Research.